Following on from the last moment in London’s history which looked at the death of Queen Anne, we pause a moment to look at the day 300 years ago – 18th September, 1714 – when her successor, King George I, landed at Greenwich as he arrived to take up his new throne. There was apparently thick fog when the Elector of Hanover made his way up the Thames accompanied by a flotilla of boats carrying his family and entourage including 18 cooks as well as his mistress, Ehrengard Melusine von der Schulenburg, and his half-sister Sophia Charlotte von Kielmansegg (known rather nastily among English courtiers as the “Maypole” and the “Elephant”). 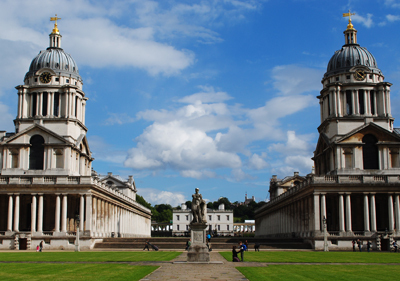 He landed at the water gates of the Sir Christopher Wren-designed Royal Hospital for Seamen, now known as the Old Royal Naval College, in Greenwich (pictured above) but when the waiting crowds cheered the disembarking king, it was a case of mistaken identity. In fact, they were cheering his son, George Augustus (and future King George II) and by the time the king actually disembarked, much of the crowd had already dissolved, leaving a much smaller – and probably disappointing – gathering to welcome him. The arrival of the king – a re-enactment of which took place at the ORNC last week – is depicted in a painting in the upper part of the the college’s Painted Hall. The work of artist James Thornhill, it depicts the king wearing Roman costume riding a chariot and appears alongside a figure of St George defeating the dragon (who, of course, stood for the papacy and family of the deposed King James II). The Painted Hall also features a family portrait of the new Royal Family, excluding George’s wife Sophia Dorothea who was imprisoned in Germany at the time following allegations of infidelity. The future King George II is featured with his back to the king in reference to the hostility between the two of them. The ORNC is currently looking to raise £5.5 million to conserve Thornhill’s paintings following a restoration of the Painted Hall in 2013. For more details, head to www.ornc.org/support/current/conserve-the-painted-hall.